Click above to zoom in. 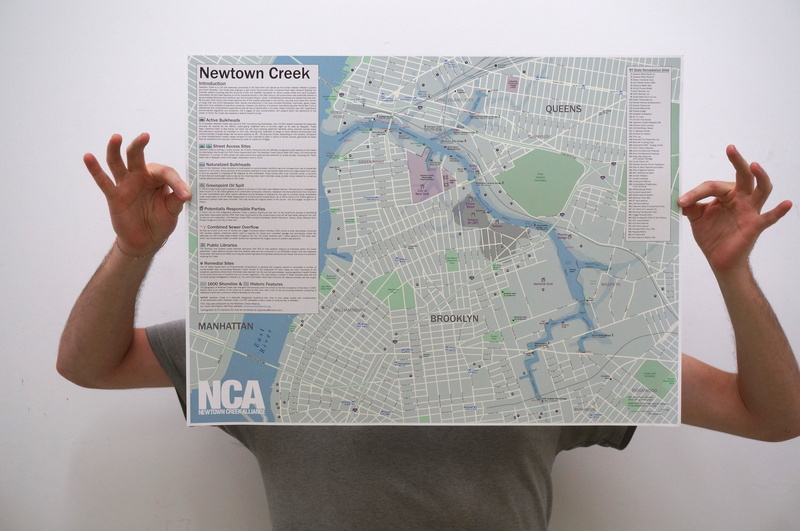 After a few months of working closely with cartographer Ed Jacobus, NCA is proud to present a comprehensive map of Newtown Creek. This very local guide highlights a number of key features including various infrastructure, historic industrial sites, active maritime use, access points and even the Creek as it existed circa 1600. The map is available as a free download for personal and education purposes* (see download link below). The printed version shown above, is available to local residents and organizations at NCA sponsored events on a first-come first-served basis. Look on our website or email info@newtowncreekalliance.org for upcoming events to get a printed copy. Download the 24″x18″ high resolution .pdf file here. Funding for this project was provided by the Greenpoint Community Environmental Fund via the North Brooklyn Boat Club. *Unauthorized reproduction of the map for commercial purposes is strictly prohibited.